Peter Ern's solo exhibition “A Place Called Home” displays new, large scale paintings predominantly focused on dry or wintry landscapes which many could argue are devoid of a detectable action or livelihood, as well as others drawing attention to the commonplace, external architectures of Sweden―Soviet-style apartment complexes, tucked away stugas/country houses, kojans/huts in the woods or inner, industrial spaces such as in Ern's Electric Light, 2011. If Ern's “A Place Called Home” is approached as a series, Electric Light, 2011 doesn't follow suit as comfortably as the others, bringing the viewer inside an abandoned space in contrast. In a way, this specific painting―thin rows of synthetic lights struggling to illuminate the emptiness of thick pillars leading to nowhere, mauve and hunter green hints in brushstrokes―adopts Lucretius' role of the clinamen: the swerving outlier or independent anomaly. Taking Electric Light, 2011 into consideration alone, it is not exceptional, but when placed alongside the others, it provokes. When considering the previous works of Ern's From Encounter to M/Från Möte Till M, it appears evident that the artist is intrigued by moments falling before or after an anticipated or unexpected event, or even those set aside for personal reflection or a pause: before entering a hotel where an event may take place (The Hotel, 2004), after anonymous individuals drive through a highway stretch leaving litter scattered midday (Roadside, 2006), a lone vehicle's headlights illuminating tall pines at night in the foreground (Winternight, 2006) or a childless playground with toys in the sandbox, half-empty cups on a wooden table (The Garden, 2006). Living and working now in Norrtälje, Ern's talent for magnifying the uninvited, the not quite, too late or too early repeats itself. 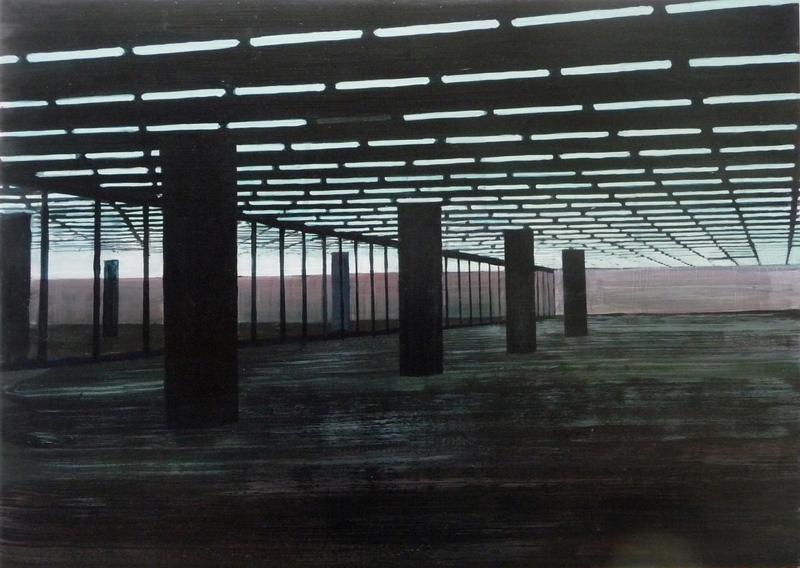 His paintings employ phantom tones, accentuating some inadequately lit reality of Scandinavia. Coming to terms with distance―between objects, people―when the timing is off; this is Ern's essence. The painter converts a secretly experienced, drab view to either a possibility awaiting or unfortunately missed. Yet the detached life steers ahead with questionable regard for any unfolding composition.